Let’s be honest. When you think about carnival, you think about Mardi Gras and the craziness of Rio and New Orleans, don’t you? You think sun and heat and half-naked ladies parading along streets in glittery over-the-top colourful costumes, and parties galore, right? Betcha the last thing you think about when dreaming of carnival is snow. Or cold. Or Canada, home to the world’s largest and most famous WINTER carnival! You read right! Last week, I wrote about my favourite event at Quebec City’s fabulous Carnaval de Québec (Quebec Winter Carnival): the gorgeous night parades. I also raved about the spectacular Hôtel de Glace (Ice Hotel), which isn’t part of the carnival but is a must-see if you’re in the city during Carnaval (from the end of January to mid-February). So let’s continue that theme with my top 5 things to do at the Quebec Winter Carnival. As I wrote last week, I wouldn’t dream of going to Carnaval de Québec without taking in one of the festive night parades. The floats themselves are really about the colourful characters, not about advertisements or huge platforms featuring an oversize figure and a bunch of dancers or princesses. The characters, whether clowns (as shown above) or a giant glowing turtle or centipede or big red top hat, are the main attraction. Scratch that. Bohomme Carnaval, the carnival’s snowman mascot, is the real appeal, and he knows it! The symbol of the 218-year-old carnival since 1954, the spirited Bonhomme always appears on the final float to great cheers by youngsters and the young at heart alike. Keep in mind that there are only two night parades, and they take place on the second and third Saturdays of the carnival. Not part of the carnival proper, the Hôtel de Glace is open from early January to late March, since it, naturally, melts come spring. It’s spectacle on a grand scale, as spectacles should be, and its ephemeral beauty has to be experienced in person to be truly appreciated. It’s a hotel made of ice and snow, after all. Feeling cold while chilling in the Ice Bar sipping cocktails out of ice glasses is part of the fun! Don’t worry, your lips will melt the ice glass a wee bit, so you won’t freeze to it. Though, you might feel your toes going numb as you wander the private suites, which are open to the public during the day, and are illuminated with coloured lights and decorated with intricate snow carvings. If you really want a cool experience, you can shell out $400-plus a night per person to sleep there, cuddling in a -30°C-rated sleeping bag on a bed of ice! During the carnival, the historic Plains of Abraham is turned into an awesome amusement park, where many of the activities take place. There’s plenty to tickle your fancy, from snow sculptures (see No. 4) and zip lining to snow tubing and snow rafting to snow slides and ice slides. There are even life-size table soccer games, and sleigh rides and dogsledding! 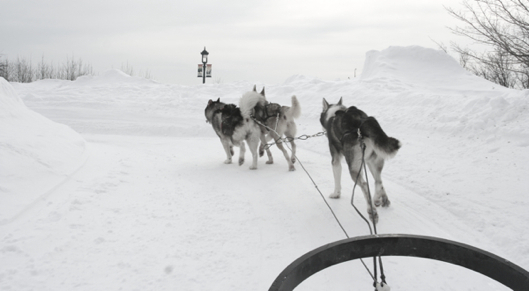 Dogsledding on a small patch of the Plains of Abraham certainly is no comparison to mushing in the wild, but it's cheap and fun! Staring at the rear ends of these dogs wasn't the nicest, so I recommend you fight your friend to stand on the runners at the back of the sled, rather than lazily sitting on the sled as I did. Be warned that you can't snap photos while you're driving, so if you're looking to shoot a few pics, opt for the seat instead. On top of the activities you can participate in, the Plains of Abraham is loaded with sporting events you can watch, like the St-Hubert Derby (horses pull sleighs in races), dogsled races, and skijoring (horses pull skiers – yes, it sounds crazy, and yes, it’s a legitimate sport!). Now, Bonhomme’s Ice Palace is not an extreme sport, but it does have a cool factor, and its new home for 2012 was the action-packed Plains of Abraham. Though it’s not on the same scale as the 32-000-square-foot Ice Hotel, the entire palace is illuminated at night and is the site of the evening dance parties, where you can shake your thang under the stars! Talk about larger-than-life characters! Every year, sculptors from around the globe bring giant blocks of snow to life in an open-air museum on the historic Plains of Abraham. 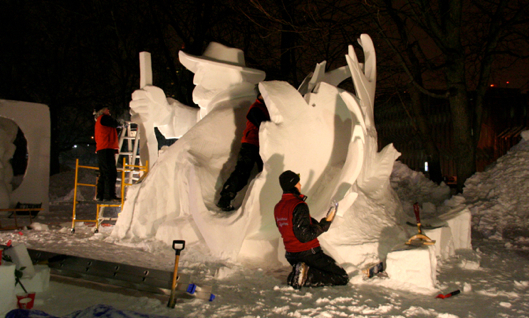 The International Snow Sculpture Competition officially opened in 1973 with just four teams participating, although snow sculptures had already been part of Quebec culture for years. Watch as groups of artists create fantastical figures overnight, then marvel at the stunning results during the day. And maybe treat the sculptors to a Caribou (the traditional Carnaval drink) or BeaverTail (a delectable flat beaver tail-shape doughnut sprinkled with cinnamon and sugar) for their efforts! I’d like to pick the crazy canoe races along the St. Lawrence River as No. 5, but to be fair, I’ve never seen teams battle (or paddle?) it out on the frozen yet flowing river, though I sure would like to! There’s a reason they’ve been holding the canoe races since 1955! But to give the kiddies their glory, I’m picking the soapbox derby. 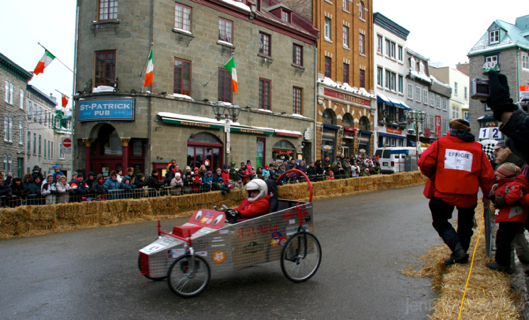 It’s fun to watch the kids in their homemade soapbox cars speeding down the streets of Old Quebec, with their families and strangers cheering them on. And while you’re in the heart of the Old Town, you can always pop into a gallery or boutique to do some window shopping under the guise of thawing your toes. 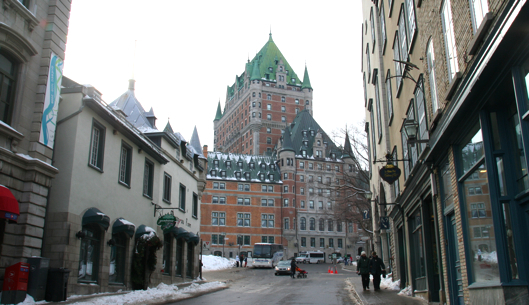 Bonus: As you wander the historic European-style streets of Old Quebec, you’ll come upon the majestic Château Frontenac. Where: Quebec City, Quebec, Canada. 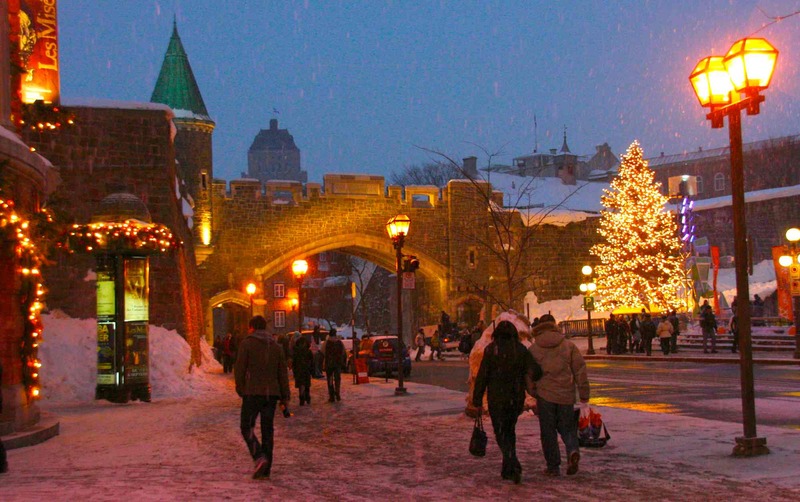 Activities are concentrated in Old Quebec, the historic Old Town. Some events take place on streets and squares, but the majority of the fun occurs on the sprawling Plains of Abraham. When: The 59th edition of the modern incarnation of the carnival runs February 1-17, 2013. Yes, I know that’s a year away, but it pays to be prepared! Cost: A Bonhomme Effigy (a figurine of Bonhomme, the carnival’s snowman mascot) is required for most activities. In 2012, the Effigy cost $13. You attach the Effigy to your coat, and that gets you access to all 17 days of festivities. That’s more than 300 activities and shows! You can buy your Effigy starting in January 2013 at hundreds of shops in Quebec City, or on-site during Carnaval. Why: It’s the world’s largest winter carnival! Plus, it’s a fun way to enjoy the outdoors. Quebec City’s historic Old Town is chock full of little galleries and restaurants, so there’s lots to do indoors if you need a break from the outdoors.